Donington Park, a grand circuit with flowing downhill curves, tricky weather conditions, and a track surface that had some asking for more . . . it all added up to a tremendous battle during the race that most people couldn't see. What is it about Rain Races that make them so nerve-wracking? Is it the intense concentration required to keep a 200+ horsepower missile in line and on track? The balance, the delicate dance of two gummi-soft tires twisting and distorting as the riders run them ragged and push them for all their elasticity and all their amazing stickiness. Crossed up, wheely-ing out of the slower corners, these tires are truly amazing - but it wasn't just the tires that won the day in Donington Park, it was the mental toughness and determination of one Casey Stoner, who brought it home on the bike that wasn't supposed to be suited to this track, wasn't supposed to go well in the rain, and wasn't supposed to win here. More than just a wet race, this was a shifting condition race, and it only added to my feelings of nervousness. I'm not sure why I feel weird about it, my boys came in a strong 7th and 9th, but I still have a deep feeling of uneasiness about the whole race, like it was anticlimatic in some way. 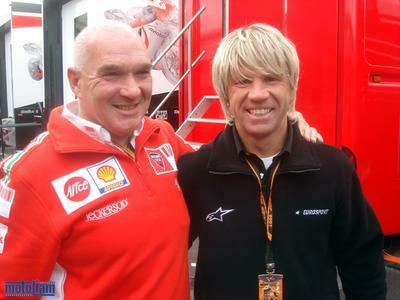 I know for sure that I have unfinished business in Donington Park, England. I will be back. After the highs and lows of the Mugello/Catalunya race weeks, what was to be a peaceful week's break turned into a frantic scramble to assemble my race kit, say goodbye to my room mate (who was leaving for the summer, and she needed the rent money! 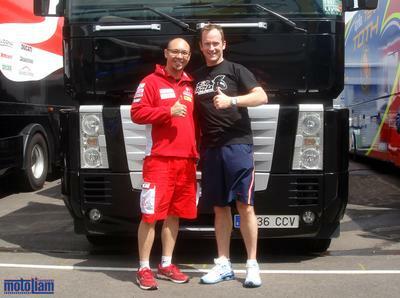 ), and also try and speed up the processes by which parts are ordered and delivered at the racetrack from Ducati Corse. It was a triumphant week for a couple of reasons - I was able to get my work done, eat a bunch of solid food, and also spin some laps of the city on my BMX. More importantly, Ducati and I had an understanding of what we were going to need to keep the ball rolling, and while I was sure we were going to make something happen, I was still a little up in the air about a couple of things. Regardless, I still had some celebrating to do from our Mugello podium, so I went out a once or twice with some friends, and the beers were cold and delicious. I hadn't expected to be nervous before the Donington race, but the night before I was to fly out of Barcelona, I had difficulty sleeping, and I would wake every one or two hours. Perhaps it was because I knew that this was to be the centerpoint of the busiest time in racing, that these six races in eight weeks would come to a head in England, and the real stresses would reveal themselves. It's a focal point for the season, these races. This is where you can gain momentum for the rest of the season, or mentally break down and give up, "because it's just not your year". I was going to do my best to make sure my Team would be strong through these European events, and then even stronger at Laguna Seca. 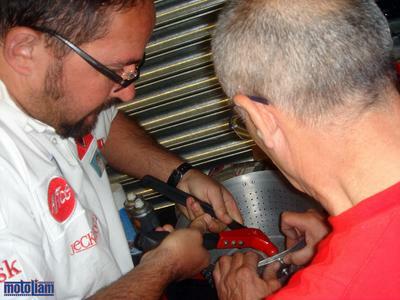 Marlboro Ducati was also doing their best to make sure their boys were at full strength for the races, and early in the week in Donington I spotted them repairing their pasta maker. Drill some holes, rivet in another handle, and voila, we're really cookin' now! The weather was probably the biggest factor in the week's preparation and racing, with heavy showers followed by bright sunshine almost every day. It was odd to wake up to thick, overcast conditions, see the clouds break, and then get dumped on just as your spirits were lifting. I often wondered about the affect this must have on the locals, because typically I've found people tend to reflect their environment quite a bit, whether it's rough, mountainous terrain, or flat expanses of nothing but fields. I'm not sure what that says about me, because it seems like I'm always on the move and have to rapidly adapt to whatever country I'm in, hahaha. 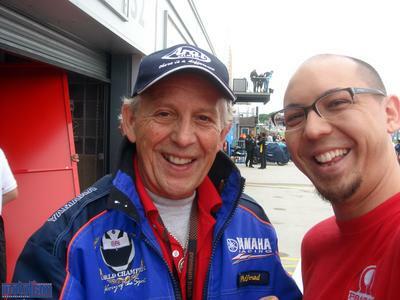 In any event, I was super stoked to be visited at the racetrack by Paul Meadows, the graphic designer who put together the Evel MotoLiam logo that you see on the corner of all the photos I post. I managed to tour Paul and his brother, Neil, through our garage for a minute and talk about the bikes and the life, and Paul just concentrated on looking good in his cool shirt. Actually, the three of us had a fantastic adventure through Nottingham, but that's a story for another day. Thanks to the new barcode scanning procedures at the paddock entrances, it's a lot easier to move about and get through the crowds, which weren't really there anyway because of the rain. I distinctly remember trying to clean fairings and wheels last year, and trying not to look like I spoke English, because there were so many racefans about dying to ask questions and pick your brain. This year was decidedly different. Like I said, the weather would shift quite often, and suddenly, too. On Thursday's Day of Champions, a host of Brits showed up at the track, among them, Sean "The Biggest Kevin Schwantz Fan, Ever" De Fraine. Sean runs the fan forum on the KS website, and is a knowledgeable and fun guy to be around - not to mention he's got great taste in clothes! We chatted about about the birds and the bikes, and then it was back into my truck to keep plugging away at my numbers. It's an interesting perspective to look at, that everything boils down to numbers, because on many levels, it's true. How fast you're going, what your level of potential is, and what you can do, it's all numbers on paper. 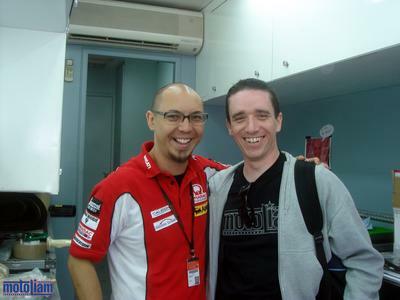 I always found it odd that Yoda-san from Kawasaki would be so blunt in his assessment of raceday finishes. Statements like "We expect him [Randy] to be 8th" reveal a strong faith in probability, but fortunately the world is full of surprises. It's the reality that almost anything can happen in racing that makes it so beautiful to watch and be a part of. I guess I wasn't totally correct in saying that there weren't crowds in the paddock, it's just that they were hanging around the Factory Yamaha and Ducati garages, hahaha. 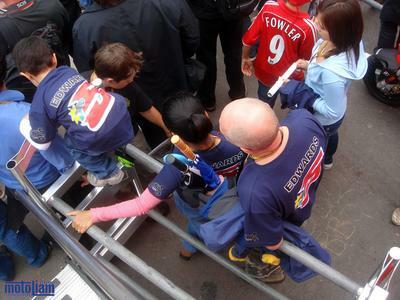 I caught up with this pack of Edwards fans waiting for Casey, and they looked like a nice little family. The littlest one was busy climbing all over the wheel carts, the teenage daughter was trying to distance herself from her parents, and it just seemed cool that they were all here enjoying the races together. Truly, this is the racing the will help define and solidify the legends of those who are out there right now. 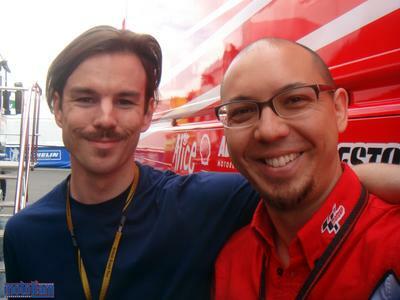 Is this the passing of the Rossi-Era? Is it time for a new force in MotoGP to lift the crown? Only time will tell, and the only constant we've learned since the advent of the four-strokes is that you can never count the Doctor out. "My Man!" 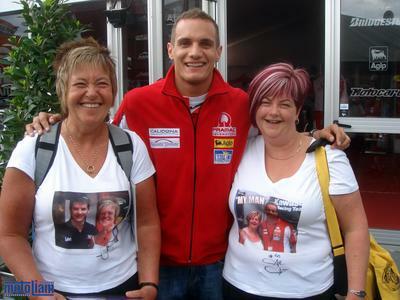 The Hoff's results this year have been fantastic, and as his season continues to improve, he's finding more and more fans. I think it's great, and with his smooth and steady style, he's sure to garner a few more solid finishes when the conditions are right. We're knocking on the door of the Top Ten in the World Championship standings, and a little extra push in the right direction should help things along. Here's looking for more top ten finishes by Alex! Woot! This was also another race which saw the running of the Red Bull Rookies Cup. American Kris Turner got on the box last time out, and at Donington, we saw both Turner and Cameron Beaubier battling for the lead all the way to the final chicane before the finish. Unfortunately, Turner was docked 5 seconds for crossing the dirt (short-cutting), dropping him to third, and Cameron ended up second. You can read more about it here. 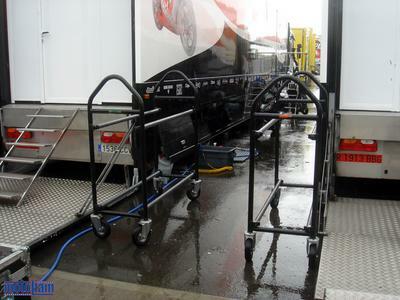 Here's shot of the facility they take to all the races, the transporter that carries the bikes and also provides the workspace for all the mechanics who work on the KTM's in the cup races. You gotta admit, that is a real slick way to carry all that gear. Maybe it's just me, but I'm more and more fascinated with how things go together, especially when it involves racing, hahaha. Could it be my childhood obsession with Legos? 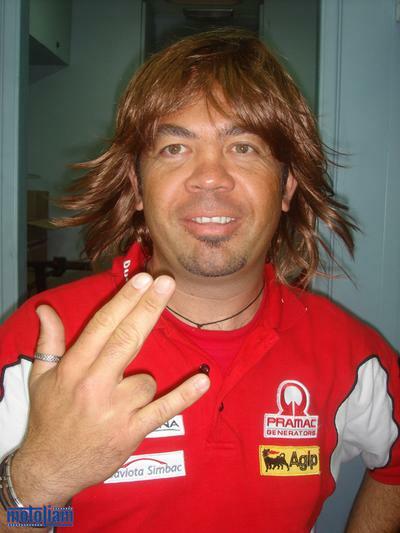 Not sure why, but Randy Mamola was having a blast running around with a wig on. Not to be outdone, we got out a wig of our own! Privateer wig, baby! What other Chief Mechanic is this cool? After the mixed conditions on Friday and Saturday, which saw a revitalized Nicky Hayden running strong on a revised chassis and with de-tuned traction control, raceday looked like it was going to be wet. 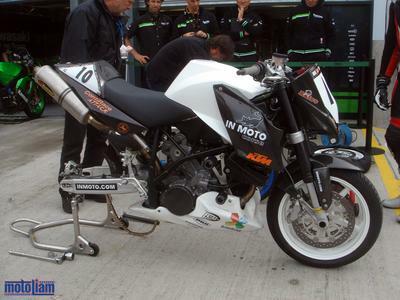 Would the Repsol machine of Nicky run well in the wet? And how about my boys? We hadn't qualified well at all, but generally speaking, Barros tends to move up 4 or 5 places per race if he's not taken out. Sometimes he Really moves up the order, haha. And with the wet conditions, I really had high hopes for the Hoff, because he's just really been doing so well in tricky situations this season. The tires, the bike, the team, it's all there for him. Personally, I'm always a going a little crazy inside when it's rainy, because it's so easy to slide past the limits . . . .
After the warmup, I met with Ross Stonefeld, a journalist from Autosport. While he's more of a car guy, he's gradually coming around. This race weekend passed in a blur for me, with chance meetings here and there. The rain had all of us tense, and knowing that we had Assen just a few days later meant that we all wanted to get Donington over with because it felt like we'd been racing for months, and we had. It's so easy to forget little things that happen, and while I try to document and remember everything, the truth is that I spend most of my time focusing on work concerns, and then I spend my "outside of work time" thinking about everything else that is not connected to work, haha. I always fail, though, because time away from the track is spent thinking about racing. 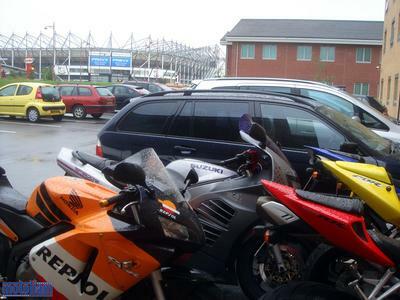 Minutes before the race, the riders suited up and layered on their plastic rainsuits. Pierro demonstrates his plastic undersuit. The race was off the hook, with some amazingly close passes being made on the ice like track surface, and the first half of the race was brilliant. Pedrosa, who looked so strong in the wet earlier, defied his naysayers and charged to the lead on the first lap. Colin pushed and pushed, taking it back and holding off Casey for so much of the race. His Yamaha was working well, and he did everything he could. Meanwhile, the Doctor stormed up through the field, diced with new-comer Anthony West (who unfortunately crashed out of fourth), and eventually finished just off the podium. What made this race so fascinating was the changing conditions, which went from a full wet scenario to a completely dry line, wreaking havoc with the super soft rain tires. Not to mention the suspension settings. I should point out that there are those riders out there with such incredible feel that they hardly change a thing except the tires when they go out in the rain, whereas other riders will completely change front and rear suspension settings and springs, maps, chassis geometry, you name it. Overall, in Donington, it was the rider's who were best able to adapt to the changing conditions who came out on top. That level of focus and concentration required to keep everything together. Testing the limits of traction on each lap, pushing ever so gently to gain that extra tenth, never really knowing where the true limit is. Rain riding is an art, and it's really beautiful to watch when a rider is in form. The biggest battles are always internal, in my mind. No one can really know what it's like unless you're right there, and the internal conflict is the one that wounds the deepist, and also provides the greatest reward for those who can overcome it. My own riders suffered somewhat as the dry line formed, as did many of the Michelin riders, and Casey himself showed amazing racecraft by keeping to the wet patches on the straights to try and keep his soft tires cool and lasting longer. Maybe Rossi summed it up best, remarking that this was their potential for the day, and they could do no more. It's not defeatist at all, but more a hard look at the reality of the race. He is never too proud to admit when he's having trouble, or if someone is riding well, and it's this ability to clearly analyze his performance and weaknesses that have helped him so much in the past. Stoner, like always, simply rode around any problems or hang-ups he might have had. Stoner just rode. Congratulations to Casey Stoner and Ducati Corse, for reaching beyond at a track no one expected them to be a major factor at - and taking home the prize! 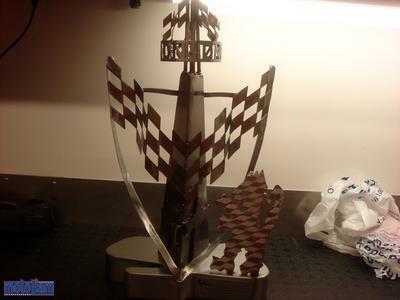 That's not the only prize they got, though, anyone care to guess where and when this is from?!? Simply beautiful, and it goes to show how deeply the passion runs between all of us. More than any animosity or grudges, we all have a huge respect for the efforts of all the Factories and their teams. Beefcake - you're the man! I was a little sad about the race, because even though Barros was able to overtake and pass Pedrosa on the final lap of the race, consolidating seventh position, I had hoped the Hoff would make it around as well. The tires were shot, and it was all these guys could do to hold on and keep it going to the checkered flag, and still, they raced. The race had stretched out, leads of seconds becoming tens of seconds, and that's how rain races usually go. The finishes are almost always determined long before the final lap, and it's a stressful waiting game to see who would crack, who would get distracted and maybe fall off, and it's that stress that left me wanting for more from this race. 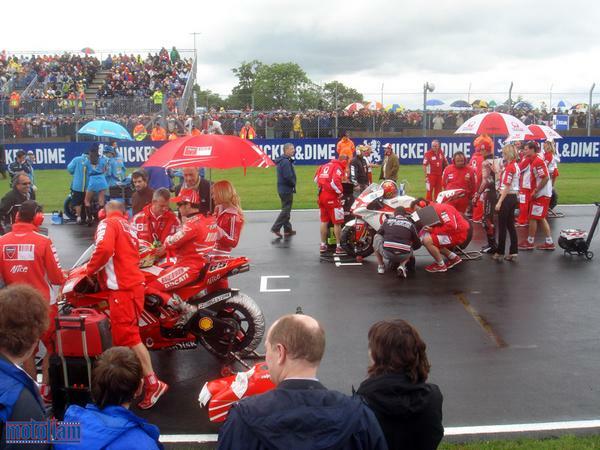 Assen would bring more rain, more of the same stress, and I headed there with mixed feelings once again. On the plus side, as we broke down the garages, we were treated to the glorious sounds of big twins booming around the now dry circuit. There was a KTM SuperDuke competition, and while this photo comes from earlier in the week, it shows just how nice these machines really are. Wouldn't want to collide head on with anything while riding one, but this tank is nothing compared to one I spotted in Holland, haha. The semi's finally loaded up, our truck drivers took off almost immediately, and the rest of us went back to the hotel for a quiet night, anticipating the next race, and the rain it would bring. Oh! And I met Phil Read! Woot! Stay tuned for more images from England - the places and faces that surround MotoGP. He's about to launch a Red Bull Veteran moto cup or something like that. What a guy!!! 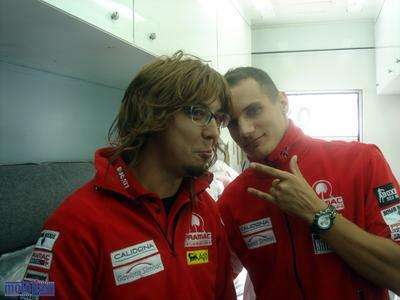 What was all that with the wigs??? Thank you Liam. The race(s) don`t seem complete until your article appears. Sort of lends closure to such an action packed season. (Speaking for Ducati fans, natch). The Pramac team is doing superbly. No more are you guys bringing up the rear. The Hoff has always interested me as a driver since before the back-up ride for Gibernau last year.Barros is full of class. You should be proud your team is doing so well. As always I`ll be looking forward to your next "insider" installment. 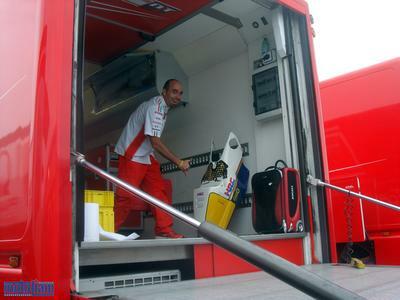 Addendum; Thank goodness for Rossi. He`s making Stoner work for it. Fabulous season!! !